With shareholders pressing the company to overhaul its board, Canadian smartphone maker RIM could be about to undergo a corporate shakeup that would result in co-founders Mike Lazardis and Jim Balsillie losing their position as chairman on the board, the Financial Post reports. According to the Post, sources have indicated that RIM may have already lined up its replacement for the duo. Barbara Stymiest, a board member since 2007, is apparently the leading candidate for the position. 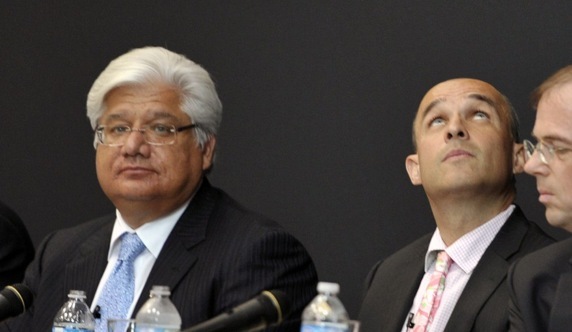 It is believed that the company has been performing an internal examination on its board structure and whether both Lazaridis and Balsillie need to hold significant board titles. The report is due to be delivered at the end of January and will require the board’s nine members to issue a response within 30 days. Sources say that the evaluation process currently under way at the company could result in a number of different options and that a final decision has not yet been made. However, sources say that Ms. Stymiest, 55, the former head of TSX Group Inc. and former chief operating officer at Royal Bank of Canada, is said to be in line to become the company’s first ever independent chair by the time the process ends in the weeks ahead. When reached for comment Monday, a RIM spokesperson reiterated by e-mail that the committee is on track to give its recommendations by the end of the month, but did not comment on the possibility of a change in board leadership. In June, RIM’s stock fell below $37 – the lowest level since 2007 – and continued to plummet over the course of 2011 as RIM struggled to turn around its smartphone and tablet sales. In December, when its share price reached $13.44, it was estimated that the company was actually worth less than Apple’s App Store alone. With the company’s new QNX-powered BlackBerry 10 smartphones not due to launch until late 2012, the company needs to reverse its decline, and quickly. Many see that ousting RIM’s chairmen as a necessary evil on the road to fulfilling its goal.